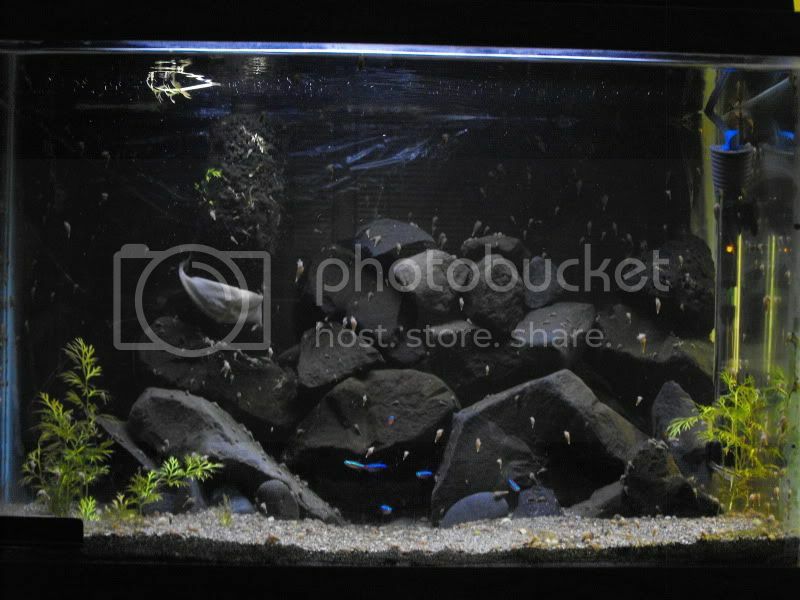 Posted: 2010.12.18(Sat)19:55 Post subject: Caton's 20g high-ish tech tank. Hello! I am starting this journal, even though there have been different fish through out the year. The tank has been set-up since around last year. I might change out the filter...but I don't want to spend that much money on the tank unless I have to. I plan on getting pressurized co2 and this tank would be my "test" tank that holds my plants until I have space for them, trimmings, even testing out the light I want to get for my 75g. Until yesterday, the fish in the tank were 5 Lamprologus brevis, but I brought them to the LFS and got 7 (was eight, one died within thirty minutes of being bagged up, but the rest survived the 4 hour car drive) cardinal tetra, and two apistogramma cacatuoides "double flame" (pair). Here is the run-down of the stocking, planning flora, and equipment. 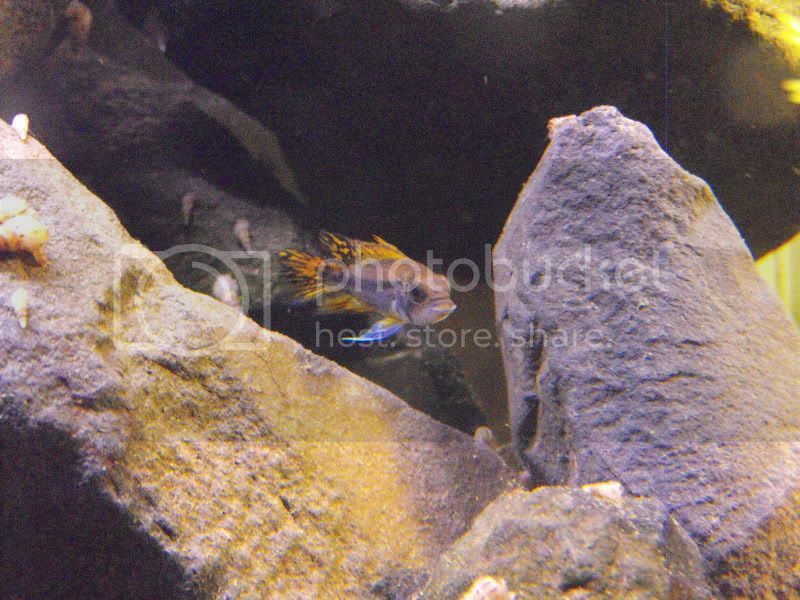 Pair Apistogramma cacatuoides "double red"
Glosso or HC...maybe DHG "belem"
"Foster & Smith Aquatics Bio System Power Filter & Oxy Surface Skimmer" rated to 55g, I am not using the skimmer. In time, I will get pressurized CO2, but that is EXPENSIVE! I mean like $200 for a system. I got some driftwood coming that I traded for some RCS. I think I might get a sun sun filter as my first canister, but I don't want to spend money to buy it I am uber poor and this is more of a "make a mistake here than in the real thing" kind of tank so I can have my 75g go up without a hitch. I might also switch of the tank itself because the silicone on the inside seems a little old. I am also using 80% r/o water. FTS with my sad little water sprites. I am ordering the light on monday. 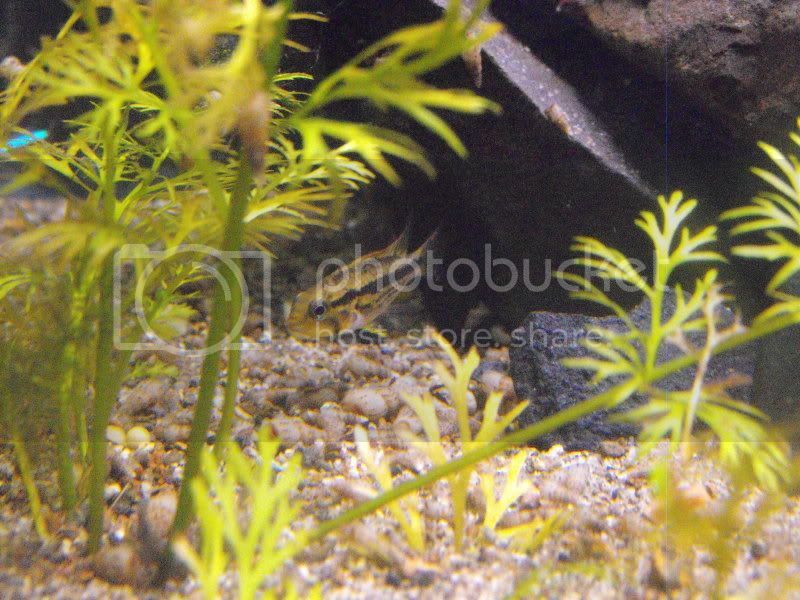 I'm going to get 6 khuli loaches instead of the 6 sterbai cories. I have a major problem with snails and I like the way they look. I also hear they have almost as much personality as cories. They may some snail eggs but that isn't your problem. 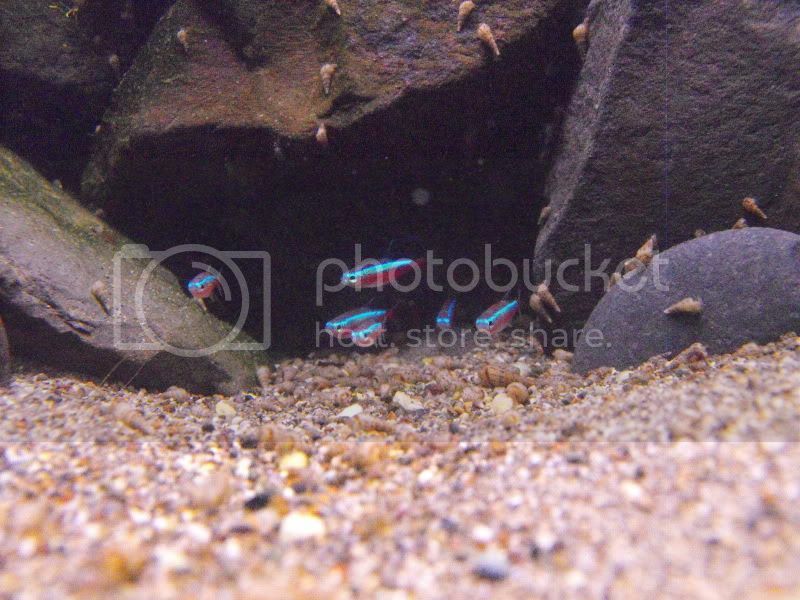 The kuhlis are very interesting engaging fish, I almost like them better than cories. They aren't out as much, they like to burrow in the substrate. I agree with diademhill, they won't touch MTS, but mine do a pretty good job on the pond snails. Those apistos are beautiful by the way! Wow, did someone say serious snail infestation? Someone mail him some assassin snails ASAP! 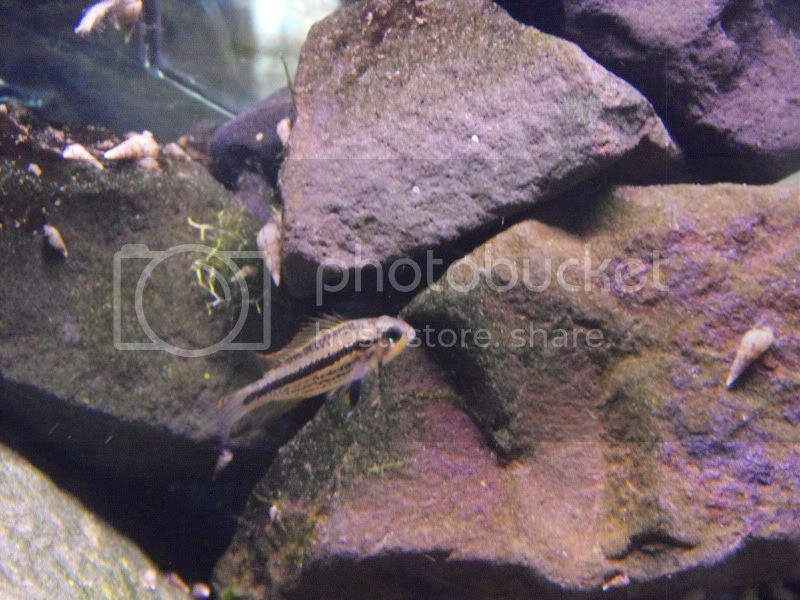 I will get 6 chain loaches (Yasuhikotakia sidthimunki). Also, in sad news, after I went skiing all day (It was a blast) I was told by my parents that one of the cardinals died. I watched it earlier and it was separated from the other streakers. My parents said it got trapped behind the rocks so I just left it for the snails to eat...I think it will be fine...I just hope more don't die. The tank is too small for Y sidthimunki and they won't eat MTS. I have three remaining in a 50g corner tank ( 3'2" largest dimension) and they zip all over it despite being eight years old and fat. 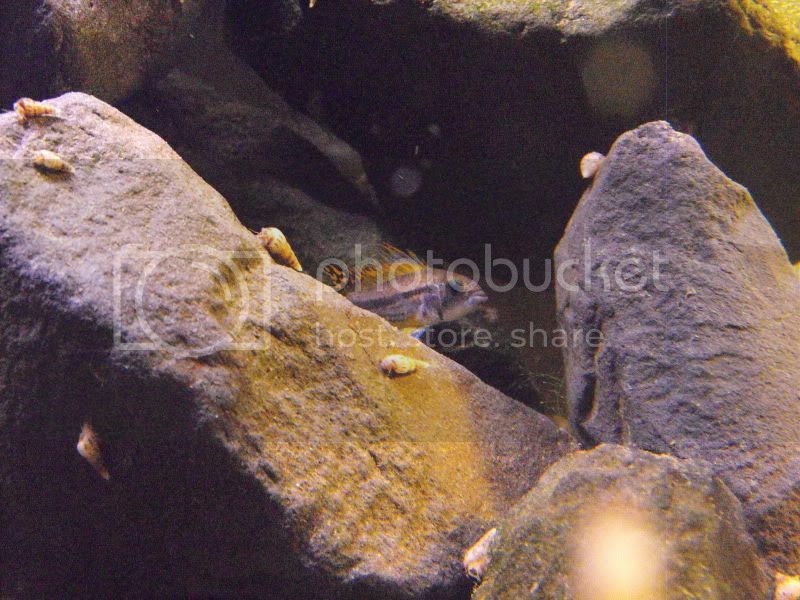 An assassin snail is your best bet. "In time, I will get pressurized CO2, but that is EXPENSIVE! I mean like $200 for a system." Then you're not looking in the right places.. Put a system together yourself. Look for someone selling a #5cylinder (make sure it is less than 5 years old, or it will need to be resealed) Regulator combo with selnoid and bubble counter ($45-70). let me know if I can help. Also all those plants + the fish = a very VERY crowded 20gal tank. Also when you go move all this to the other tank(75gal) please drop the gravel and either go with a planted subtrate or playsand / PFS. Your plants and bottom dwellers will appreciate it. The Sunsun is an excellent purchase. I will get assassin's soon. One thing you don't know is that I am getting a 15# tank, maybe even a 20# tank. I will be getting a 3 way split so that way my, 20g,10g, and 75g all have co2. I have been able to manage without co2 on a high light tank, I will be supplementing my carbon source with excel until then. I don't want to go cheap, have something break and gas all my fish. Personally, I have seen plenty of people do this. I know that this tank is going to be crowded, that is what I want. 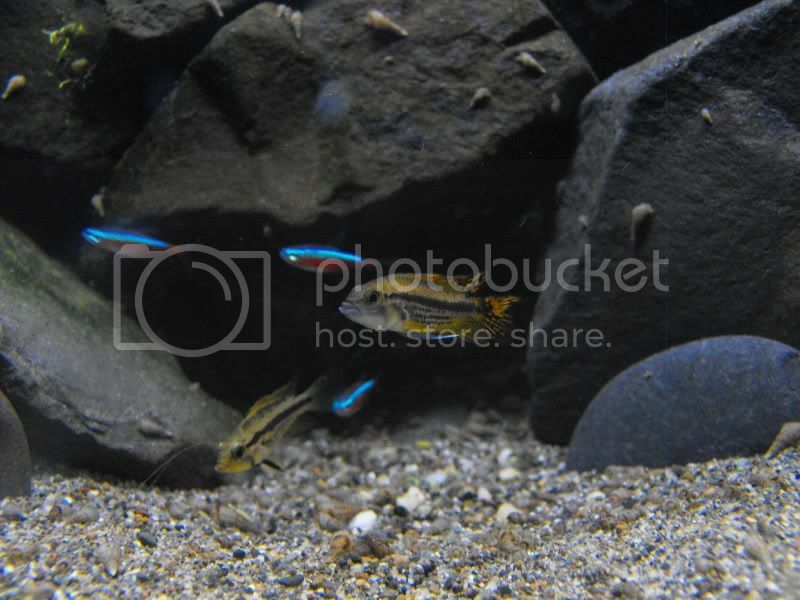 I am choosing fish that don't have territory issues, (the apisto's might have a issue, but I have another tank in the process of cycling in case they do get aggressive. This tank has lots of fast growing plants, plus you don't know what my scaping plan is. I just got a bunch of glosso in the mail today, so it will have a pretty open space that is with low-growing plant. Also, may I add that I don't have gravel? It is sand. There are a few pieces of gravel. You can't make assumptions with other peoples tanks. You can keep 30 neon tetras in a 20g, if you give them perfect water conditions (I test my water weekly and each time it is perfect, even in my "un-perfect" stocking tanks). I do weekly, even twice weekly changes with r/o water. One thing you don't know is that I am getting a 15# tank, maybe even a 20# tank. I will be getting a 3 way split so that way my, 20g,10g, and 75g all have co2. OK great, but WHY do you have to have a 200.00 regulator. Buddy of mine just bought a Dual Stage regulator off of ebay for .99. Now I will say finding one that cheap is RARE. FYI Dual stage is TWICE as better as single stage. MOST of the retail regulators (milwakee) are single stage. So buy a top notch needle valve. There is a dual stage on ebay now, exact one he just got, once you replace the needle valve and few other upgrades you now have a 400.00 regulator that you paid less than 120.00. I know you can, but that wasn't my point. So scratch out the maybes *** and you have 5 very big plants that will overshadow your mid-ground/forgound plants. THAT is what I am saying she I said crowded. I care nothing about your filtration or wc's.